Students are getting far too capable these days. There used to be a time when you could be confident in the security of your job knowing that you’d years of experience between you and the graduate working as an intern in your game studio. Path of Shadows shows that time is long gone. While only a small project to show off their talents, Path of Shadows promises to be an excellent way to spend an afternoon. Until Journey comes out on PC (and, let’s face facts, it won’t be any time soon) we’ll be starved of that beautiful cel-shaded adventure. 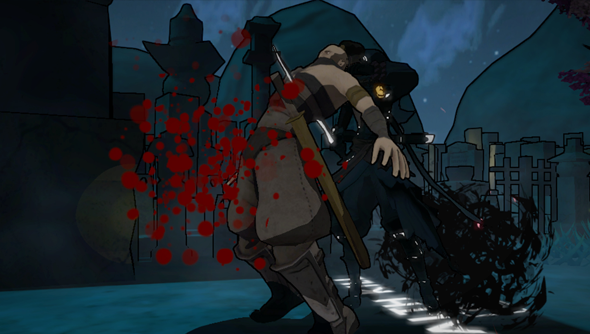 In Path of Shadows we find a game that taps that same vein of style but puts it to a more murderous purpose. You play a resurrected warrior infiltrating a a mountain prison to free a goddess. As a recently undead you have access to abilities that the guards you’re overpowering might call a tad unfair: you can teleport between shadows. Even when there are no shadows to teleport to you can grow new ones out of thin air. These shadows can eat the corpses of your enemies. And, seeing as you’ve the training of a ninja, there will be a lot of corpses. Currently, Path of Shadows is just a small project, a portfolio piece, and one that will soon be released for free. However, with a project this accomplished I hope they’re putting thought into expanding it into a more lengthy game.